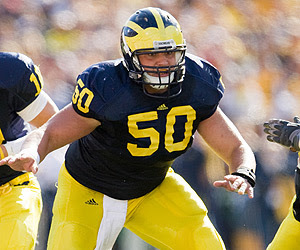 Welcome to the season preview of the 2010 Michigan Wolverines. In this series of posts we'll dive head first into each position, providing in-depth analysis of all the main contenders and a little bit of speculation just for fun. It's never an easy thing to predict how well an offensive line will do for an entire season. The OL is much like a living, breathing thing...it changes constantly. 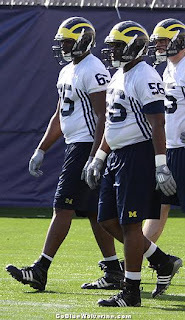 Every player I mentioned above will play at some point for the Wolverines this season. It really all boils down to a complicated formula of experience, depth, injuries and consistency. 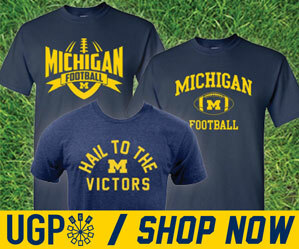 Michigan's line looks to improve from 09 in all of those areas. We do lose the experience of Mark Ortmann and David Moosman, but we also gain the experience of some of the players who were forced to step up amid some of the injuries that plagued us last year. 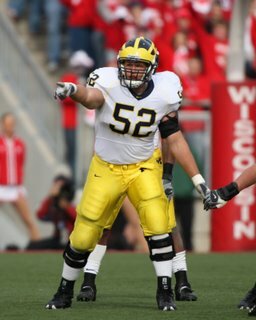 As a candidate for the Lombardi Award and Rimington Trophy in 2009, it all starts in the middle with C David Molk. He only started 4 games last year, but started 12 games in 08. Not only is he the heart and soul of this line, but maybe the entire offense. When he went down against EMU last year with a foot injury, the effects of his absence were felt throughout the offense, including a jumbled up OL. He made his return to action against Penn State, and went down with a knee injury (ACL) in the first series. He missed the rest of the season and also sat out the spring, he's expected to be back and 100% for fall camp. The left side of the line sees two very different but very capable starters. 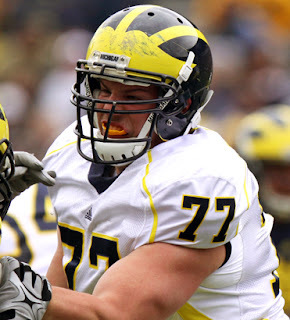 At guard, veteran Stephen Schilling has the most experience of any OL this season. His leadership in the middle of the line, along with Molk, provide the foundation for a successful line this year. Next to Schilling is redshirt freshman Taylor Lewan. Lewan made a splash this spring when he was in there with the starters...and rocked it. 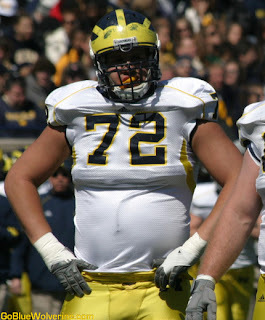 He has all the skills and then some of any freshman lineman Michigan has ever had...and that's saying something. He looks a lot like Jake Long when he was a freshman. I fully expect Lewan to anchor the left side of the line well. The right side of the line also looks solid. Sophomore Patrick Omameh and junior Mark Huyge provide more experience as both saw pretty serious playing time on 09. Omameh played in 7 games last year, starting the final 3 games of the season at RG. Huyge started 9 of the 12 games in 09, splitting starts between tackle (4) and guard (5). Huyge also spent quite a bit of time on the special teams unit as well. Countdown to kickoff - Day 28 spotlights RG Patrick Omameh, and how he went from a puny 251 pounds when he stepped foot on campus, to two years later tipping the scales at 298. As Patrick puts it, "I put on a couple since I've been here. I still feel the same so, nothing big." Yeah, 47 pounds of pure muscle...nothing big. What makes any offensive line great is not just experience, but depth. Michigan has just that. Seniors Perry Dorrestein and John Ferrara, junior Zac Ciullo, sophomores Rocko Khoury, Elliot Mealer and Ricky Barnum, and freshmen Christian Pace, Michael Schofield, Erik Gunderson and Quinton Washington could all see some playing time this season without a doubt. Again, depth is huge this year for Michigan's OL. If we can maintain our health up front, I have no doubt we'll see measured improvement overall from 2009. It's clear that we have the depth and experience, all that's left is for these guys to gel as a unit and grow during fall camp. The OL is a position where 5 guys really have to come together as 1 and play cohesively. If we can limit injuries, and can keep this unit intact throughout the season, I have no doubt by the time the season is through, Michigan will have one of the most potent and efficient offenses in the Big Ten.